Heat oven to 375°F. Spray 12x8-inch (2-quart) baking dish with cooking spray. In 10-inch nonstick skillet, heat oil over medium-high heat. Add chicken; sprinkle with salt and pepper. Cook and stir 6 to 7 minutes or until no longer pink in centre. Remove chicken from skillet; add to baking dish. Sprinkle with shredded cheese. In glass measuring cup, microwave marinara sauce covered on High 1 to 2 minutes or until heated through. Pour marinara sauce on top of cheese layer, spreading to cover cheese layer. Remove dough from can in 2 rolled sections; do not unroll dough. Cut each roll into 4 slices; cut each slice into quarters. Add Parmesan cheese and bread crumbs to 1-quart resealable food-storage plastic bag; add crescent pieces. Seal, and shake to coat. 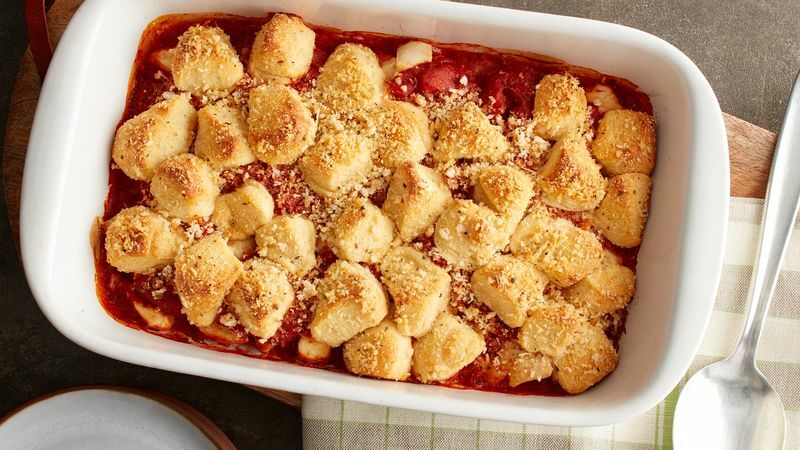 Arrange crescent pieces on top of chicken mixture; sprinkle with remaining Parmesan and bread crumbs. Bake 25 to 30 minutes or until crescents are deep golden brown and completely baked through. Use your favourite variety of marinara sauce to customize this dish. Serve with additional grated Parmesan cheese, if desired.